In the recent study by The University of Manchester, HKUST-1, one of the extensively studied Metal-Organic Framework (MOF) for gas separation, was evaluated as a model material for CO2 capture from flue gas stream. Flue gases contain percentage of CO2 of 5-15%, N2 70-75%, and water vapour of 5-7%. HKUST-1 behaviour was studied with these gases at conditions similar to those of flue gas emission at temperature of 50-75˚C. The synthesis was first improved in terms of gaining high production yield and suppressing the by-product formation. According to Nadeen Al-Janabi from The University of Manchester, “The synthesised samples showed good CO2 capacity in comparison to N2. While, the hydrothermal stability test (water vapour adsorption) showed that HKUST-1 in its current form is hydrothermally instable neither at high temperature nor at room temperature. 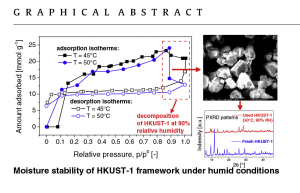 The outcome is to modify the structure of HKUST-1 to enhance its hydrothermal stability otherwise it cannot withstand humid flow such as that of flue gas. To assess the moisture stability of HKUST-1, the water vapour adsorption was measured using DVS 1 “Surface Measurement Systems”. Improved hydrothermal synthesis of HKUST-1 at 100˚C with the yield up to 89.4%. Evaluation moisture stability of HKUST-1 under relevant flue gas adsorption conditions (45–60˚C, 0–1 barG). 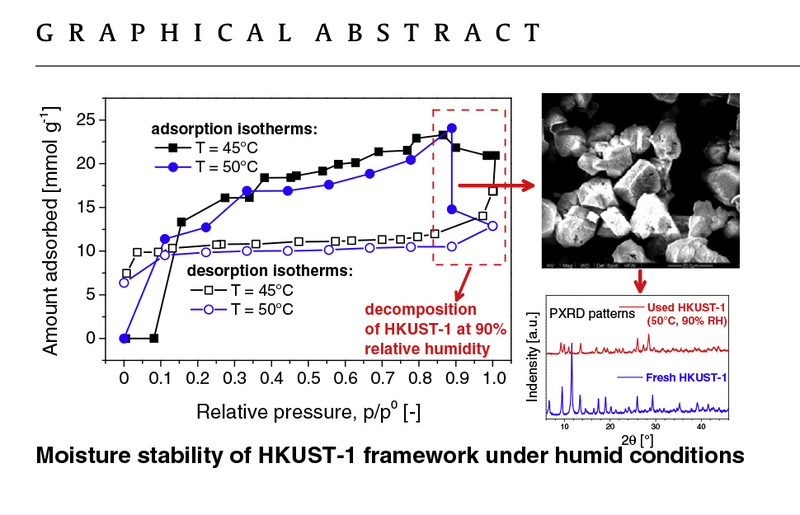 Interpretation of decomposition dynamics of HKUST-1 under humid conditions. Aggregation of water molecules near copper centres can displace the BTC ligands leading to the decomposition of HKUST-1. The study was performed by a group from the School of Chemical Engineering and Analytical Sciences, The University of Manchester and Department of Chemical Engineering, University of Bath. It was presented at the 13th International Conference of Carbon Dioxide Utilisation in Singapore and has won several awards and recognition. A second paper in connection to this study is about to be released soon. Read full article on “Mapping the Cu-BTC metal–organic framework (HKUST-1) stability envelope in the presence of water vapour for CO2 adsorption from flue gases” Authors: Nadeen Al-Janabi, Patrick Hill, Laura Torrente-Murciano, Arthur Garforth, Patricia Gorgojo, Flor Siperstein, Xiaolei Fan, Chemical Engineering Journal 281 (2015) 669–677.